We’ve put together this Upwork FAQ to give you an idea on how Upwork works and how to make the platform work for you. Whether you’re just starting, or already have experience looking for work or someone to get something done for you, you can use the knowledge we’ve gathered in this article to become an expert on using Upwork. Feel free to use the table of contents below to jump to your desired question. How is Upwork different from oDesk? What are some of the top Upwork hacks? How do I land a job on Upwork? I am a freelancer who wants to work on a pay-per-hour basis. How do hourly contracts work exactly? What are the top 20 skills on Upwork? I’ve seen a lot of blogs online talking about how to make big bucks on Upwork if you do it right. Is this an exaggeration? Should I hire on Upwork or hire independently? How can I find quality freelancers on Upwork? Are there better freelancers on Upwork than other platforms? Upwork is a popular freelance platform that connects a database of millions of freelance professionals with jobs from around the world. This global platform is a great way for independent contractors to find work, and for companies or individuals to find talented freelancers. 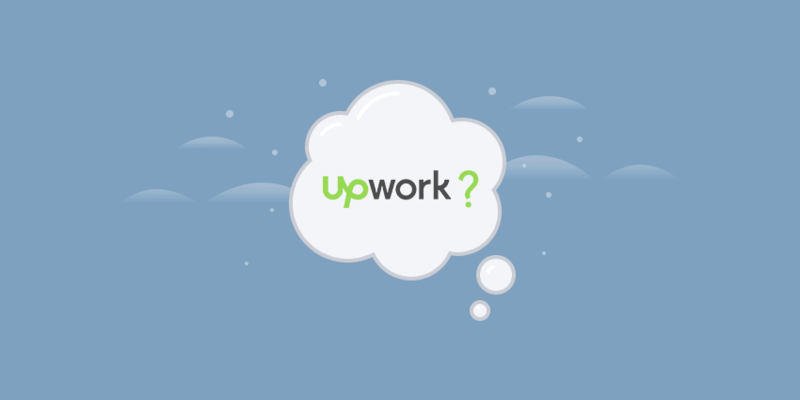 Below are some general questions about Upwork that we hear pretty often, followed by common questions from freelancers and companies. We hope these answers will be useful to you as you explore the benefits of remote work and outsourcing in your careers and businesses. oDesk and Upwork are the same thing. Upwork was created as a merger between oDesk and another popular freelancing site, Elance. One of the biggest improvements from oDesk to Upwork is a new Message Center that will allow companies to chat with a freelancer available for immediate work. Even those who are not signed up for this recruiting website can use this message system. How does Upwork work? How much do they charge? Upwork fees are paid by the freelancer. The Upwork Service Fee is 5% – 10% of the total amount charged to the client, which is paid automatically depending on the size of the contract. It’s important to note that although the fees are paid by the freelancer, many will adjust their fees depending on what they want to make. Therefore, businesses pay higher fees indirectly as a result. Businesses can avoid these higher fees by using an alternative service (a few are covered in a question below) such as Hubstaff Talent, which doesn’t charge a percentage. It’s essential to complete your profile and get a few reviews on your page. Complete some projects for the experience, or if you have current clients ask if they would be willing to assign you one or two of your tasks via Upwork so your record reflects successfully completed jobs. When listing skills, be specific. Instead of listing “website designer” say “WordPress designer” or “eCommerce website design.” When you send in a job proposal, tailor your cover letter and show that you’ve done your research on the job and company. Finally, take the Upwork tests and verifications available to you. These are a great way to show how skilled you are in grammar, coding, design or whatever your chosen field is. Add a test in your job description to find the candidates who are truly interested in working with you. For example, ask all applicants to include the word “moo” or “blue” in their cover letter when they apply. This is a good way to weed out applicants who send out generic cover letters in bulk. Also, be sure to look at the actual skills and qualifications of your candidates, not just their hourly rate. Ignore how much they charge and select the best freelancer based on their profile, past work history, and cover letter. Saving a few dollars by hiring the cheapest bidder could turn into a headache later on when you’re getting low-quality, ineffective work. The sheer number of other freelancers and competition. Upwork is saturated with more than 10 million registered freelancers. You will be battling multiple other talented professionals for jobs. Not only is there a lot of competition, many freelancers who live in countries with a lower cost of living can afford to charge clients significantly less than freelancers in more expensive areas. The basics of Upwork are this: sign up, fill out your profile and start applying for jobs. Sometimes, clients will reach out to you to see if you’re willing to work for them. However, it’s more likely that you will have to do the legwork and find jobs that suit your skills. Freelancers will submit applications for projects, then the clients will select the freelancer they are most impressed with. Start with your application. Make sure that your materials are accurate, you send everything that was requested, follow instructions and your documents are well-written. Be sure to write each cover letter separately, depending on your client. This will show the client that you have paid attention to their company and project. I am a freelancer who wants to work on a pay-per-hour basis. How does the client know how many hours I’ve worked? Upwork has a system that tracks the time you work and bills your client weekly. The Upwork team app has a timer that you can start when you begin work. However, if you want to track time outside of Upwork, you may use alternative time tracking software with automatic invoicing. While there have been many success stories, being successful on Upwork is not guaranteed. How much you make on this platform depends on a number of things, from your work ethic, how many hours a week you’re willing to work, your hourly fee and the quality of clients you attain. Whether or not Upwork is a better choice for you than the many alternatives depends on what you’re looking for. Upwork has a free app to help you track time and ensure automatic weekly payments, 24-hour customer support and a client feedback system you can use to find great freelancers. It also has a large database of talented freelancers, but there are more than 100,000+ projects posted each month. That means you’re facing competition all around for the best talent. Upwork is also a little expensive, with a 10% fee taken from every payment. Start with a detailed job posting. Make sure you include all the required and recommended skills and responsibilities to discourage unqualified candidates from applying. Add a unique identifier in your post, such as a request about how to title their resume file, or to include their years of experience in the field in the cover letter. This will show who has paid attention to your job posting. Avoid offering low starting pay, as talented freelancers aren’t likely to apply for low-paying jobs. Look at their experience, previous work, and how many hours they’ve worked to get an idea of their background. Be sure to interview them on Skype before hiring them, and have them do a [paid] test project before coming on board. There are a lot of steps to hiring quality freelancers, but getting the top talent is definitely worth it. Read our detailed walkthrough on how to find a VA on websites such as Upwork. It’s guaranteed to give you some ideas even if you’re looking to fill a different type of vacancy. Many freelancers who are registered on this platform also have accounts on platforms like Freelancer.com. Services like Toptal and Outsourcely screen their freelancers more carefully, and Hubstaff Talent is completely free to both employers and freelancers. Some freelancers are better than others, but there is such a wide range of talent you can’t rely on all Upwork freelancers being either better or worse than freelancers on other platforms. If you enjoyed this post, you may want to check out 10 websites to find freelancers online, tips for success to find freelance talent and five personalities to avoid when hiring on Upwork. This post was updated on February 23, 2018.